The Local Program will take place at The Johns Hopkins Hospital on Thursday May 2nd at the Johns Hopkins Hospital in the Chevy Chase Auditorium with Dr. Paul Manson, Dr. Ray Morgan, Dr. Redonda Miller (President of The Johns Hopkins Hospital), Dr. Andrew Lee (Executive Vice President for Academic Affairs, Provost, and Dean, University of Texas Southwestern Medical School), Dr. Rick Redett (Interim-Director, Department of Plastic and Reconstructive Surgery), Kevin Sowers (President of the Johns Hopkins Health System and Executive Vice President of Johns Hopkins Medicine), Dr. Chetan Bettegowda (Director Meningioma Center, Johns Hopkins Department of Neurosurgery,) Jennifer H. Elisseeff, PhD (Morton Goldberg Professor, Wilmer Eye Institute and Biomedical Engineering, Translational Tissue Engineering Center, Board of Maryland's Technology Development Corporation (TEDCO), Johns Hopkins School of Medicine), Ellen J. MacKenzie, PhD - Dean, Johns Hopkins Bloomberg School of Public Health, Gregg L. Semenza, MD, PhD (Albert Lasker Basic Medical Research Award 2016), Dr. Peter Agre (Nobel Prize 2003) and John M. Colmers (Vice President, Health Care Transformation and Strategic Planning, Johns Hopkins Medicine). 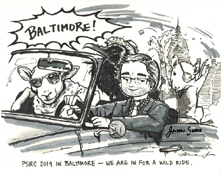 Thursday programming will be followed by a Welcome Reception at the National Aquarium that evening in the inner harbor. On Friday May 3rd, we will host the Members Dinner at The Walters Art Museum. It will be a night of toasts and presentations to honor the past, the present and the future of our society. On Saturday night, May 4th, we will celebrate the integration of the PSF-RFW with a gathering in Harbor East overlooking the Inner Harbor. We will take this celebration to the highest of levels! The central meeting hotel is The Hyatt Regency, situated in the heart of Baltimore's Inner Harbor. The acclaimed National Aquarium (Welcome Reception) is situated next door. Those preferring the sights and sounds of the city will be greeted by hundreds of shops, restaurants, and museums. The Lewis Museum, which explores Maryland African-American heritage, sits several blocks east of the aquarium and, to the south in Federal Hill, you can find the Science Center, Museum of Industry, and quirky American Visionary Arts Museum. Just a short walk (or water taxi) away is Harbor East, boasting some of Baltimore's fine gourmet dining and a lively nightlife. Trek to the rooftop of the Four Seasons to enjoy the opulent Bygone, for dinner or drinks with an absolutely stunning panoramic view of Charm City. Dozens of restaurants line the waterfront, allowing you to enjoy your meal alongside the bay with everything from traditional Maryland seafood to Japanese (Azumi), Lebanese (Lebanese Taverna), and Argentinian (Bar Vasquez) cuisine (just to name a few!). A short walk from Harbor East is Fell's Point, a quaint neighborhood with cobblestone streets and waterfront taverns. Those looking for an evening retreat will find the Sagamore Pendry, a century-old warehouse turned award-winning hotel, and in the heart of Fells' cobblestone center is Max's Taphouse, renowned for its 100+ beers on tap. We will all have a blast here! If you travel north from the conference center, you will find a different Baltimore gem: Mount Vernon. This is a refined and historic neighborhood, dominated by the beautiful original Washington Monument. Those with a taste for history can venture though the stunning Peabody Library or the Walters Art Museum (Members Dinner), while a lush assortment of restaurants line its streets. Two Baltimore institutions include The Brewer's Art, a brewery meets restaurant, and The Helmand, which serves delicious Afghan cuisine. Those looking for boutique luxury can seek out Hotel Ivy. Those with additional time to explore beyond the city's bounds will find a region ripe with history and national beauty. Fort McHenry, birthplace of the national anthem, is a short venture (or 3 mile waterfront run) south. A twenty-minute drive east is Patapsco State Park, thick with waterfalls and springtime greenery. Personally, it has been an honor to serve as Chair of the PSRC over the last year. We have created an environment of diversity, inclusion and academic rigor. The society has had significant increases in membership and participation. The academic program is truly spectacular and I have no doubt we all will learn many new things. We are all very excited for you to visit Baltimore and explore its offerings. If you have any questions about the city or your visit here, do not hesitate to reach out.